This article explains how a school in Hong Kong addresses transdisciplinary learning in Chinese class. It illustrates this process by making authentic connections with a year 5 unit under the transdisciplinary theme ‘How we express ourselves’. In Kennedy School, the Chinese language teachers are involved in the transdisciplinary learning of the students. We do this by identifying one specific unit of inquiry that we can support through authentic connection with the teaching of skill and knowledge of the Chinese language and culture. By doing this, students will explore the central idea through the perspective of the Chinese language or culture. In year 5, under the transdisciplinary theme of How we express ourselves, the central idea is: Engaging in and reflecting on a range of creative experiences broadens our understanding and appreciation of art. 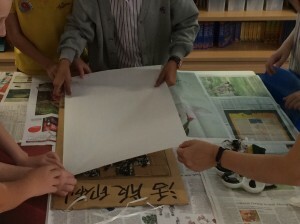 During Chinese language classes, the students inquired into the different Chinese art forms, such as Beijing opera masks, Chinese water painting, seal-making, porcelain and printing blocks. They were encouraged to discuss and share their thoughts about how these communicated aspects of the Chinese culture and traditions. 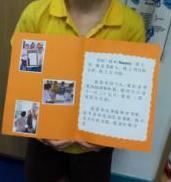 Throughout this unit the students demonstrated curiosity towards the Chinese culture including its history and values. They applied new understandings when creating their own work of art in response to a particular Chinese art form. explored a range of different writing styles and had meaningful discussions about the styles, shapes and strokes of different forms of writing. were encouraged to inquire more closely into the origins of the printing blocks and to explore the different printing techniques, materials, structure and use. By comparing the normal writing on paper and the backward writing on the printing blocks, word recognition skills were strengthened. made connections between the relevance and significance of printing blocks. They were challenged to sort out words and produce a passage for printing. created the printing blocks according to the words from the passages they produced. This developed understanding of sentence patterns and structures. shared their work and talked about it with their classmates. This enabled them to have a good understanding of how artists use different art forms to communicate their ideas. worked together in small groups to recreate and print passages of a text using the printing blocks they created, which expressed their understanding and appreciation of Chinese art. This also developed their understanding of sentence patterns and structures. As the second line of inquiry was more closely related to language learning, the engagements were differentiated across the three different pathways. The students were taught: specific words and phrases to express like or dislike; descriptive phrases for comparing and describing works of art; characters for these words and phrases. The students were given all the language tools they needed to express themselves successfully. When shown different works of art, the students were asked to describe how it made them feel. They were encouraged to listen to each other and consider other views. Here again the students were taught specific words and phrases to describe their feelings towards a piece of art. More specifically the students in this pathway inquired into the difference between Western and Chinese water colour paintings. To aid them in their inquiries, they tried using different tools to create different water colour effects. Throughout this process they were taught words, characters and phrases to describe the different effects, tools and feelings toward the art. When creating their own works of art, students were encouraged to look at the possible effect of Chinese painting. They were asked to explore their feelings after they finished their paintings and demonstrate understanding of the connection between the flower/plant themes and what they symbolize in the Chinese culture. This assessment provided Pathway 2 students opportunities to reflect and connect in Chinese class. When creating Beijing Opera masks, different types of characters were introduced to students explaining their characteristics, with “Painted Face ‘Jing’” as the main focus. The follow-up activity was to research how colours related to the characteristic of “Jing”. Students were guided to reflect on their own personality, to draft their own masks and create a reflection connecting their colour choice to the personality they wanted to show. Finally, as an action of this unit, the students presented their unique masks to other classes. They were taught how to express their ideas towards works of art and keep an open mind towards others who expressed a differing point of view. The students used conversations, debates and forums to share their feelings and thoughts towards different pieces of art. The central idea was unpacked and students studied ancient Chinese poems, essays, stories, and idioms. Students used guided reading materials to find out key words and key sentences and presented their understanding of the central idea and lines of inquiry by writing complex exclamatory and interrogative sentences. During these activities, students observed that all ancient Chinese works have a seal, representing the author’s name. Students then used an online seal generator to create their own works. By the end of the unit, students had developed a good understanding of the different Chinese art forms and could express and respond accordingly. Exploring different Chinese art forms enabled the students to form a good understanding of how artists could use different art forms to communicate different ideas. Students’ listening and speaking, reading and writing and presentation skills were strengthened. This engagement kept the students motivated and enthusiastic as they created their own art work, which expressed their understanding and appreciation of Chinese art. This developed the students’ understanding of sentence patterns and structures. The opportunity to relate this unit with Kennedy’s Art Exhibition. More information on Chinese literature books should be prepared and used earlier. This unit took about 2 months to finish. It is a bit too long, so time management will be an area to improve. * Pathway 1 is for students who are learning the Chinese language as a second or additional language and who often have limited Chinese language experience or knowledge. **Pathway 2 is for students who have learned Chinese as a second or additional language for a few years. They may have the opportunity to use Chinese in daily life and have achieved some oral fluency and basic literacy in reading and writing, eg is able to make a simple conversation and read and understand some characters (different from each year level). ***Pathway 3 caters for native and near native Chinese language speakers who have achieved basic linguistic and literacy accuracy that help them to read and understand Chinese texts. 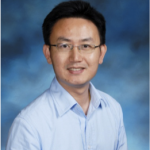 Denggao Zeng is the Head of Chinese Department at Kennedy School (English Schools Foundation). He has various teaching experience in international and public schools both in Hong Kong and New Zealand. 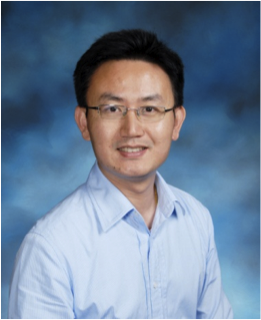 He enjoys taking on challenges to explore effective ways to teach Chinese language to students from different cultural and language background. Do awards really motivate students?